There are so many avenues for audio recording these days – podcasts, vocals, instruments, voiceovers or interviews. Whether you’re involved in any of the above as a beginner or professional, it’s important to have the right equipment to get the job done. The market for audio products is so wide and deep that it can be a pain to find the best bang for your buck. We’re taking out the guesswork for you, our readers, and listing below the best microphones you can buy from $50-$1000. We’ve divided this article up by price point and gone into detail with each addition to the list. You’ll find high quality products that fit different purposes and budgets. It doesn’t matter if you’re a singer or a vlogger; we’ve gathered together an array of mics that have impressed us in areas such as style, sound quality, and special features. Our first selection on the list is the Blue Snowball ICE, coming in at just under $50. It’s a no-frills, easy to use product that’s a great choice for beginners. ICE is a cardioid polar pattern condenser that comes with a USB connection port for easy connection to your computer via the provided cable. The microphone is quickly detected by PC/Macs as an audio device and very easy to set up. This mic features an unusual round design that stands out from competitors. The spherical shape has a circumference of 325mm and is fairly large. As we mentioned earlier, the ICE is a no-frills mic, so there aren’t any crazy switches of extra ports on it. But if you like the Blue Snowball ICE and need extra features, check out the non-ICE version that comes with an omnidirectional polar pattern and a -10dB switch pad to reduce ambient noise even further. Though the mic features a cardioid polar pattern, it can pick up background noise easily, so we recommend getting a pop filter to back it up. Due to its unusual design storing the mic may be tricky, since it weighs 460 grams. If you somehow haven’t heard about CAD, then let us introduce you – they’ve been in the industry for the past 85 years and are known for producing great studio mics in a reasonable budget, as well as other audio devices. The CAD U37 is no exception. For the price, CAD U37 offers a variety of features – many more than its competitors – making it great for studio use. But before we get into those features and the performance of this device, we want to mention that it comes in a myriad of colors: black, gray, white, orange, cherry apple, red and white, champagne, silver, and camo. The large diaphragm of this mic features a smooth and extended frequency response with a cardioid polar pattern. The sounds recorded come out smooth and warm. It’s an ideal companion for guitar players. The CAD U37 has an old-school design that might not appeal to the youth, which may be part of why the company chose to include so many different color options. It has a -10dB switch pad and a switch for bass reduction. The package comes with a gold plated USB and a plastic tripod stand. If you’re someone who travels while recording you should be taking a closer look at the Samson Go mic. This condenser microphone is designed for portability and can easily fit in your pocket along with all of the included goodies. It holds up well against other studio mics in terms of performance. Priced under $50, the Go has a lot going for it – it’s small, but packs a punch, and includes some great features. The metal housing of the mic is attached to a plastic clip that can easily be attached to a laptop screen, allowing for easy recording. There’s no need for a tripod for this device unless you so desire. Moreover, the plastic clip can be attached to a mic stand as well (with the provided bolt) in case you don't want to bend for too long while recording vocals. The manufacturer has included a headphone monitoring jack that offers zero latency. Check out our other lists for great headphone options in a variety of price ranges. On the left side of the mic is a toggle switch allowing users to toggle between omnidirectional and cardioid polar pattern, and the mic can be set to a -10dB switch pad to completely reduce ambient noise – another plus for traveling audiophiles! This is one of the best vocal mics under $50, however we did find the Samson Go to be a bit sub-par when it came to recording musical instrument. All in all, the Go delivers a lot considering its small size and highly affordable price. The Meteor has a futuristic design available in three colors: chrome, titanium black, and brushed nickel. The microphone features tripod legs attached to the body for convenience. The legs can move 180 degrees allowing for easy adjustment. The front of the mic sports a mute button surrounded by a volume knob. Above this is an indicator LED light, and the back features a USB port to connect to a PC/Mac as well as a live headphone-monitoring jack. The Samson Meteor’s diaphragm is large at 22mm, and can record smoother sounds and wider frequencies ranging from 20Hz - 20kHz. It offers 16-bit depth and audio resolution of 44.1/48kHz that is enough for recording CD-like audio quality. When it comes to performance we’ve found this mic to be slightly on the bass-ier. Nonetheless, the Meteor is an ideal companion for recording acoustic electric because its bass emphasis reduces distorted noise. The Meteor is also compatible with Apple iPad using Apple's Lightning USB Camera Adapter and is a breeze to connect to a PC or Mac as you don't need drivers to get started. If you aren’t a regular reader at theroundingsound.com, let us mention once again that we’re big fans of Audio Technica products and have featured quite of them in various buying guides, including this one! This side address condenser microphone comes with easy USB connection that makes it an ideal companion for people who enjoy creating podcasts or recording gaming session commentary. The ATR2500’s industrial design gives it a sober yet elegant look. Audio Technica gave this mic a large diaphragm that comes with volume controls at the front, along with a live monitoring headphone jack on the underside. The package includes necessary accessories such as a tripod stand, mic mount, and a 1.8m mini-USB cable to get started. The ATR2500 comes with 16 bit depth and 44.1/48kHz audio resolution. Weighing 366 grams, the mic is easy to carry around without much fuss and the nearly 7” long body ensures that it sits comfortably on any desktop. One downfall that Audio Technica ATR2500 does have is that it comes with a frequency response of 30Hz-15kHz, which is slightly less than the competition on this list. Other than podcasting and vocal recording, we found this product to be the best microphone for recording acoustic guitar in this price range. This is an ideal mic for acoustic musicians. We’re moving into this next price range with another Audio Technica product – the AT 2020+. There’s an earlier version of this mic, the AT2020, that comes with XLR connection. The 2020+ has USB connection – but if you’re more interested in the previous version, check it out here. But back to the 2020+ - let’s talk about what comes in the box. Aside from the mic itself, Audio Technica has also included a microphone mount, small tripod stand, long USB cable for PCs and Macs, and a padded microphone carrying pouch. We cannot stress how great that last addition is! It really makes a difference for anyone who travels with their equipment. Like the previously mentioned Audio Technica ATR2500, the AT2020+ only comes in black. But this isn’t a problem if you’re more concerned with quality rather than looks. The mic comes with cardioid polar pattern and is made completely out of metal, giving it a sturdy frame. There are a few controls on the body as well; two round dials on the front for mixing mic audio with computer audio and controlling headphone volume, and a live monitoring headphone jack at the back of the device. Because this microphone is quite heavy, and the provided tripod stand isn’t durable enough, we recommend getting an aftermarket tripod stand or, if you’d like to save desktop space, an arm stand. Any condenser mic list would be incomplete without the inclusion of the Holy Grail of all condenser microphones - and that is the Blue Yeti. 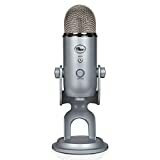 Blue Yeti has been a game changer when it comes to high quality professional microphones at an affordable price. The mic comes with a huge list of features to talk about and just writing a short description doesn’t do this product justice. For starters, the mic has a tri-capsule array that has ability to record in any scenario and is capable of recording vocals, podcast, gaming commentary, voiceovers, acoustic and electric guitar, wind instruments, and everything in between. There is also the inclusion of four different polar patterns; cardioid, omnidirectional, bidirectional, and stereo. The Yeti is available in a plethora of colors – blackout, whiteout, space grey, vintage white, midnight blue, and silver. It features a hemispherical metal grille, volume button with LED indicated, and volume knob. The back comes studded with a gain control knob and multiple polar patterns selector knob. The base of the mic has a USB port. Rode is a premium audio brand that deals in manufacturing quality audio recording equipment for every purpose. The name is synonym with quality products, and the Rode NT-USB is no exception. The mic itself comes in a package along with a USB cable and mic stand, as well as a Rode-branded pop filter, which means you won’t have to spend money on after-market accessories. The NT-USB is available only in black, but the sleek design makes up for that. This 0.5 inches medium diaphragm cardioid condenser microphone has support for 16 bit 48kHz resolution audio and can quickly get started with DAWs like GarageBand or Protools. It weighs around 520 grams and with the included storage pouch can be carried around effortlessly. Rode NT-USB features two knobs to direct mix with the mic input and source input. Beneath these is a headphone monitoring jack for real-time audio listening as you record. This mic is an ideal companion for singers. The Rode NT-USB is a clean, simple option for no-fuss recording in this price range. Yup – another double feature on our list. Rode is such an impressive company that we’re including the NT1KIT. It’s at a slightly higher price point of around $300, but we’ll tell you why it’s worth it. 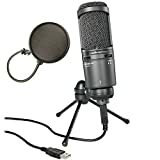 The package contains a pop filter, premium shock mount, and microphone storage pouch that compliments the mic’s design. This mic is best suited for professional studio artists looking for clean recording on vocals and instruments. This new Rode NT1 is the 4th generation microphone in the NT1 range, which stretches as far back as the 1990s. The NT1KIT comes in matte black. It’s the first XLR condenser mic on our list (we suggested another as an alternative, but didn’t feel it was the best fit for us). It’s equipped with a cardioid polar pattern with a frequency range of 20Hz to 20kHz that is capable of recording a wide variety of sound. 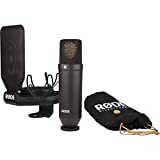 The company claims that Rode NT1 is the quietest condenser microphone in its category and only generates 4.5 decibels of self-noise while in use. This video below puts the mic to a real-life test of recording rap vocals. Check it out and judge for yourself! 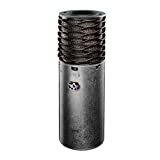 The Aston Microphone Origin is manufactured in US and has captured attention quickly due to its unique design. Just like its big brother the Aston Spirit, the Origin is small in size and looks almost like a water filter with the mesh grille. The grille is also a built-in pop filter surrounding the circumference of the mic and is made using mesh-knit technology. The build of this mic is impressive. With a rigid body and the mic chassis a solid 2mm of stainless steel, for the price customers are paying they’re getting amazing quality. The Aston Origin is a cardioid polar pattern microphone that houses a 1-inch gold evaporated diaphragm capsule versatile enough to be used with most instruments, especially acoustic guitar and vocals. Its high-end transformer-less design reduces the overall weight and helps in create a smooth and intimate tone for natural sound. This XLR condenser mic features two switches on its body: one is a -10dB pad while the other is a 80Hz low cut filter made to help reduce unwanted noise and extra bass. Since it’s an XLR mic, it requires a 48V phantom power supply that can be easily provided by an audio mixer like the M-Audio M-Track 2x2. The environmentally friendly box it comes in also holds a bolt to fix the mic to a stand, however no additional accessories are provided – you’ll have to do a little shopping yourself and spend some extra money. The AKG C214 is a go-to mic for professionals looking to get a studio-grade quality microphone at a fairly affordable price range. Featuring a vintage British Radio Broadcasting-like design, the AKG C214 gets a little retro on us while still out-performing its competition. The large diaphragm on this mic makes it a cost-effective choice if you’re into the AKG family. With the same functionality as the popular C414, this mic is a 1-inch capsule with integrated suspension. It contains an attenuator that can absorb up to 20 dB of mechanical noise and it produces recordings of SPL 156 dB. Because of the low cut filter available, it can be used on stages even for the close-up vocals and with high brass, guitar amps, and drum overheads, etc. The double mesh of this omni-directional microphone reduces resonance, and if you're looking for sonic accuracy, this is one of the best options on the market. It is neatly designed with scratch resistant technology, an XLR type gold plated output, and a metal grille. The C214 as a package comes with a windscreen, a spider shock mount, and a carrying case. The best part is that it can work with any voltage in the range of 9V to 52V, making it one of the most versatile mics on our list. The Aston Spirit is the big brother to the previously mentioned Aston Origin mic, however the difference lies in that the Spirit is a multi-pattern microphone that comes with cardioid, omnidirectional, and bidirectional polar patterns. It’s also much larger when compared with the origin, and features three on-board toggle buttons for changing polar patterns, the dB switch pad, and the low cut filter. The Spirit itself features plenty of premium features, but there is a slight disappointment in packaging inclusions – there aren’t any. The diaphragm on this mic is a 1” gold evaporated condenser, covered by a built-in pop filter made of stainless steel mesh knit. It would be a crime not to mention the excellent design of this mic, which makes it eye candy and sturdy enough to have a long life. But no matter how sturdy the chassis of a mic is, its internal circuitry is delicate enough to get damaged with one fall. Aston kept this in mind and included a shock resistant wave-form like mesh head that protects the capsule during sudden falls or heavy knocks. Moreover, the Aston Spirit doesn't require a shock mount due to its effective internal shock absorption mechanism. You’ll be able to attach the mic directly to a stand. Since it’s an XLR condenser microphone, you need a 48V Phantom Supply to power this microphone. The first version is called AKG C414 XLS and is made specifically for recording audio equipment. The AKG C414 XLII is marketed more toward vocalists. 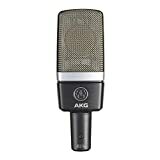 AKG's C414 series has been going on from the late 1960's and the overall design hasn't changed much, but it's still the best reference grade condenser mic that you can buy right now. Before we get into the mic and its features, let’s take an inventory of what's inside the box: like the previously mentioned AKG C214, the AKG C414 comes in a similar, solid box with thick foam padding. The box contains the mic along with a high-quality plastic spider shock mount, pop filter, and foam windscreen. Unlike other microphones featured on our list of condenser mics the AKG C414 comes with 5 polar patterns: cardioid, wide cardioid, hyper cardioid, omnidirectional, and bidirectional. The back features a 0dB/-6dB/-12dB/-18dB switch pad and next to it is a 0/40/80/160Hz low cut filter. The microphone has an electric impedance of 200 Ohms and frequency range of 20Hz - 20kHz. Not only is the C414 the best microphone for recording acoustic guitar, electric guitar, and drums, but you can record professional quality audio with more delicate instruments such as the violin and mandolin. If you’re looking for a mic to fit vocal-specific needs, go with the AKG C414 XLII, and the AKG C414 XLS for recording instruments. Neumann is a common sight in studios and used by professionals to record some of the best hit songs that we hear today. 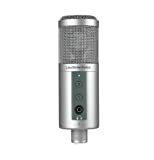 The TLM 102 MT is the smallest condenser mic from this brand and has a modern, compact look. Compared to the previously mentioned AKG C414, the Neumann TLM 104 MT comes with only a cardioid pickup pattern - however it offers 144dB maximum SPL and 50 Ohms of rated impedance. Though the microphone is not high on features compared to other mics in our list, when it comes to quality, the Neumann TLM 102 MT stands out from the crowd. The 102 MT is a large diaphragm microphone but weighs only 210 grams, making it one of the lightest portable mics we’re backing. It also has a foam lined grill that eliminates the need for a pop filter and prevents the mic from recording hissing sounds. The 102 MT is a great companion for the studio, but is also surprisingly easy to get started with. If you’re looking for the best microphone for recording drums this would be an ideal choice. For the price, the company doesn't provide many accessories - just a stand mount. 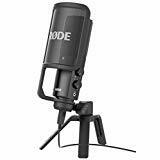 You may need to buy a spider shock mount and mic stand along with an XLR cable to use this mic to its best standards.